The Physics Groupie Blog: First Light! I wonder how many of you remember when you saw your very own “first light” of the universe through a telescope. It is a very personal experience, and everyone reacts to it in a different way. 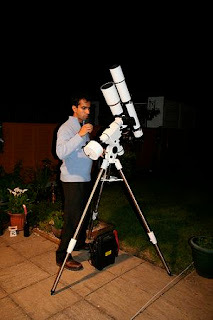 My first light experience was with my younger brother’s Celestron 6-inch reflector telescope when I was in my twenties. I probably took a peek through the Griffith Observatory’s original 12-inch Zeiss refracting telescope when I was a youngster during a field trip circa late 1960s, but I don’t have a good memory of that experience. Sometimes first-light experience can serve to overwhelm like what I observed when I was observing a group of Sidewalk Astronomers members in Pasadena’s Old Town one summer weekend evening. A few teenage boys around 14 years of age looked through the telescope that was trained on Jupiter and its Galilean moons. The boys were experiencing first light and they got so excited they literally danced through the streets in glee, exclaiming “I love Jupiter!” It was heartening to see the light go off in these young people’s heads. My hope is that they’ll remember this moment years hence and think of astronomy as an exciting and worthwhile endeavor. Of course it is advantageous for children to have their first light experience early on in life. The important perspective that kids gain by this experience is a valuable one that can shape their life view in a very positive way. It is a delightful thing to see a child peer through a telescope’s eyepiece to gaze upon the Moon’s Sea of Tranquility and tell them that men have walked across its plane – wide eyes of enthusiasm! Alas, I suspect that many adults haven’t seen their first light, even in this time of the 21st century with regular Space Shuttle launches, spectacular Hubble images, and the International Space Station completed at last. But all that this signifies is the importance of outreach efforts by educators, researchers, and amateur astronomers alike. The next time you’re out with your telescope, take a moment to look around and find someone who hasn’t had their first light experience. I guarantee you’ll feel quite accomplished.